ONE of the original boy bands is back in town – but now it really is for the last time, according to Jimmy Osmond who, at a youthful 48, is the youngest member of The Osmond Brothers line-up which comes to Exeter's Riverside Leisure Centre on March 10, and Plymouth Pavilions the following night. "We are out to persuade people we are young men who have still got a lot of work to do and a lot of things to give," Jimmy says with a smile. "But this particular line-up of brothers – the original brothers who wrote all the songs and produced all the shows – really now want to try some different things." The Osmond Brothers – Merrill, Jay and Wayne – have been working together for half a century and have remained the core members of a family group which has seen Alan, Donny and Marie as members of the band, as well as Jimmy. 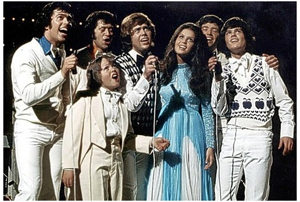 The two oldest Osmond siblings, Virl and Tom, were born deaf. "I've worked with them for over 45 years, so I am sort of the new guy," Jimmy laughs. "We've done this for so many years and Merrill really wants to try something different. "While I am not saying we will never perform on a television show or something like that again, we won't do any more tours. And of course as a family we won't disband, so it's bittersweet for me." The Osmonds are unique in their success as a band and as solo performers. They have recorded over 200 albums, selling over 100 million copies with 59 gold and platinum recordings. They have sold out venues worldwide, breaking box office records and received countless awards, most notably in 2003 when they were honoured by the industry, receiving a star on the Hollywood Walk of Fame. "And we are the longest living group of original members who have never disbanded," Jimmy says. "It's been such a lucky experience, especially for me, being the youngest. "We've tried every genre of music, we've played everywhere in the world and we've been taught by so many different and amazing people. If you'd told us we have had this experience when we first started we would never have believed you," Jimmy says. "We just keep our noses down and keep trying to reinvent ourselves, keep trying to do different things, and this body of work that my brothers have achieved is really quite impressive." The Osmonds have promised that the tour will take fans on a journey through their many unforgettable hits, from classics such as 'One Bad Apple', 'Down By The Lazy River', 'Let Me In' and 'Love Me For A Reason' to 'Crazy Horses' and 'Long Haired Lover From Liverpool' – the 1972 number one from Jimmy, who has more recently appeared in London's West End in Grease and Chicago. "In our concerts, we don't try to shove new material down anybody's throat – we like to do our job and help reminisce and help people remember their lives through the music that meant something to them. "The songs that come up the most, that people want to hear, are often not the ones by Donny, Marie and myself but the ones the brothers actually wrote. You people in the UK understand your music history and you know what true artistry is and I think in songs like 'Crazy Horses' the sound of the brothers really comes through," he says. Jimmy, of course, has achieved success both on and off stage and is familiar to many people not old enough to remember the Osmonds in their heyday as a regular in pantomime and also on television programmes such as I'm A Celebrity and Come Dine With Me. He is also a respected television and live entertainment producer and is president of Osmond Entertainment. "I'm just interested in trying different things. I don't have it all figured out but I sure am grateful for what has come my way. I love coming to England. "We don't deserve the loyalty that we've experienced from you all, but we're very grateful for it. I just like your style – the way you do things – and I have always enjoyed the time I've spent in England," he says. The family remain devoutly religious, their Mormon faith being the bedrock of their lives, but, as Jimmy says, this doesn't mean everything is always sweetness and light. "We don't always get along, of course, but we somehow have learned to agree to disagree about things and for everybody to have their own life. That's one of the reasons why this is the final tour, because we're still young enough to try different things. We would never want to stifle each other and we really do celebrate each other's successes individually and collectively." They are, though, all hugely excited about the prospect of returning to England and although they have played in huge stadiums and arenas all over the world, there is a reason why this tour is entitled 'Up Close and Personal'. "When I was in the show Chicago recently, I toured all over the country and I've been back to places I played on my own or have done panto in or whatever other crazy things I've done. "But one of the things we wanted to do this time was not play big arenas – we've done that. We wanted to play smaller venues because for us it really is more fun to be up close and personal with the fans, and so that is why we have called the tour that," he says. "It's fun because we can change our show depending on the mix of people. We will also reminisce, too – when we first started, all the experiences, the good times and bad times. These things make us what we are today," he says, thoughtfully. "People don't just want to hear about all the joy and the roses – they want to hear about the tough times that you made it through. We've never been afraid to talk about the bumps and bruises as well as the successes because I think that's what makes you who you are. But it's ultimately not just about us. "We were just lucky enough to have a song on the radio that influenced other people's lives." For more information, or to book tickets, see www.osmond.com or telephone 01392 221771 (Exeter Riverside Leisure Centre) or 0845 146 1460 (Plymouth Pavilions).